Volvo. A underrated car company with great lines of cars! Great, safe, and fun to drive. Great sound system. Unfortunately does not come with AUX or Bluetooth only a CD player. Decent on gas. It drives smoothly and is great for a first car. Pretty fast for a station wagon. A negative would be you cannot put the back seats down to make extra room for stuff like some other Volvos can do. It has power steering and cruise control. Heated seats great in snow. 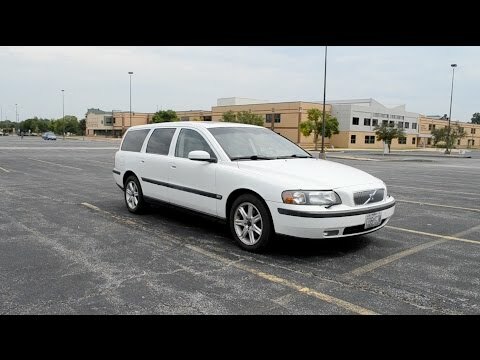 V70 Volvo is reliable, easy to maintain, very safe and cost effective gas mileage heated seats good control in snow conditions I would own another if the model was still available, looks younger than its age repairs are seldom with the exception of general maintenance some features are showing there age but overall a great reliable safe vehicle. Love the Volvo line. It is low riding, so uneven terrain can scrape the bottom. Because it sits low, tall curbs can make it hard to open the door. I like that my vehicle is great for outdoor adventures like camping, since there is plenty of room for tents, bikes, luggage, etc. I do not like that it uses a lot of gas. I also don't like that it sits low, so bumps or uneven terrain can cause scraping of the undercarriage.